TULSA, OK (KJRH) — When the U.S.S. Tulsa is commissioned on February 16 in San Francisco, the Tulsa manufacturing company U.S. Pioneer will be in attendance. 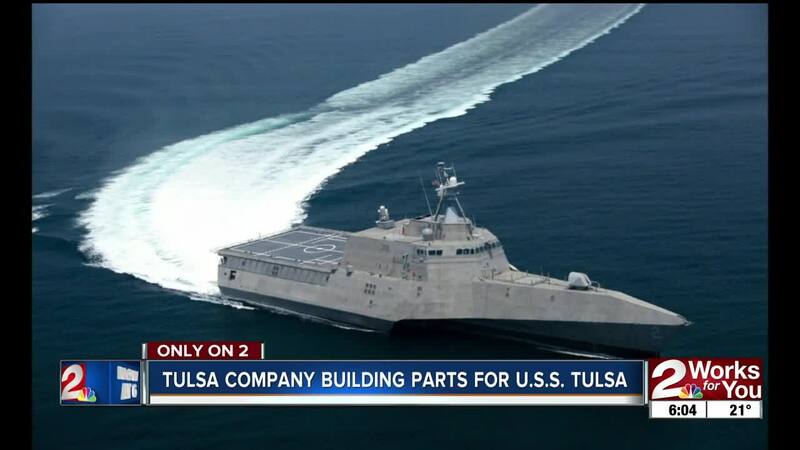 They helped build parts for the U.S. Navy's newest littoral combat ship - the first time a Navy ship has been named for Tulsa in more than 70-years. Quality Control Manager Pat Reeves shared the excitement of his coworkers when he heard the company would be building parts for the Navy's newest ship. "It's a big honor," Reeves said, "and it's really nice knowing that the parts we're building are going aboard the Tulsa - supporting that effort." Everything made at U.S. Pioneer has to be rugged, durable, and reliable. The manufacturing team of about 50 builds parts that aren't made anywhere else in the world, and has been building electrical equipment for Navy ships for the past 20 years. Reeves, who served in the Navy for seven years, says the job they do is incredibly important. He stresses that to each of his coworkers, and everyone who walks through the doors. "Almost everything we do here has a life-safety aspect," Reeves said. "Knowing aboard submarines, and U.S. Navy ships around the world, that every time one of these things goes out and it gets installed, it needs to work first time every time." U.S. Pioneer has put out parts for several classes of ships that are now all over the world. The U.S.S. Tulsa will become the Navy's 16th littoral combat ship (LCS). With a low draft and a high hull speed, the LCS is a fast and agile specialized ship, according to the U.S. Navy. It can serve multiple purposes and is adaptable to different situations, and can patrol close to any shoreline. "I'm really happy to see this," said Seth Lapidus, U.S. Pioneer President. "Overall it gives us a sense of pride to be making what we make, and having it out there in our Navy and all around the world." When the U.S.S. Tulsa is commissioned, it will mark the first time a ship has been named for the city since the last U.S.S. Tulsa was decommissioned in 1946.